This is a sequel to an earlier article that spelled out the problems with daily aspirin to help prevent heart attacks and strokes. 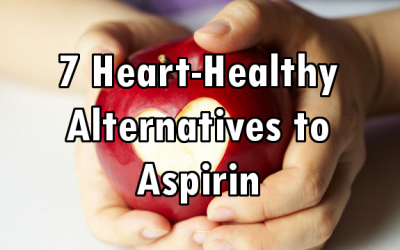 The earlier article explained why the daily aspirin routine is not only ineffective, but it’s dangerous. It leads to a plethora of other problems and gastrointestinal issues while doubling the risk of strokes without reducing fatal heart attacks. 1. Arginine or L-arginine is an amino acid that can produce arterial dilation to keep arteries from constricting. Arginine generates short term nitric oxide (NO), which acts only when needed to keep blood cells from clumping and clotting, but allows coagulation to occur when appropriate. 2. Vitamin K2, found in nattokinase or as separate supplements, keeps calcium from hardening along the inner artery walls of your arteries. This is usually what causes hardening of the arteries, calcification of the inner walls. K2 gets calcium out of the blood stream and into bone matter where it belongs. 3. Hawthorn berry has been used in Oriental Medicine for centuries. It is usually consumed as a tea. You can purchase or make your own tinctures as well, which many consider more potent than teas. Hawthorn berry is a vasodilator (artery and capillary dilator) that also strengthens the heart muscles and helps maintain regular heart beat rhythm. 4. Tocotrienol, found in natural vitamin E and some CoQ-10 products, or even as a separate supplement, is a natural anti-coagulant without side effects. 5. Cayenne at a minimum SHU (Scofield Heat Unit) value of at least 40K taken with a teaspoonful twice daily (or more) in solution with water is recommended highly by Master Herbalist Doctors Christopher and Schulze. After gulping a small 1/3 to 1/2 water solution with a teaspoonful of cayenne, I chase it with iced Hawthorne berry tea or iced lime/lemon water. Cayenne has even been known to stop a heart attack that’s underway. 6. Magnesium is vital for heart health. It is necessary for maintaining a steady heartbeat rhythm and it also helps bone matter absorb calcium, thus reducing calcification within blood vessels. 7. Ascorbic acid (vitamin C) and Lysine combined is my personal favorite, maybe because it’s so easy. It’s also what Linus Pauling advocates as extremely effective for cardiac health with healthful side effects. He recommends L-ascorbate or ascorbic acid (Vitamin C) 5-6 grams a day in divided doses, L-Lysine 5 grams a day in divided doses, and L-Proline 2-3 grams a day in divided doses. Those amounts are mostly for those with cardiac issues already. I use half as much for prevention. Here’s much more on that protocol. Proper diet and moderate exercise, not smoking or using excess alcohol, relaxation, and meditation are among the common sense lifestyle rules that serve as your foundation for heart health regardless of any supportive supplement choices you deem necessary. But the above supplements should indeed help. A mini aspirin a day will keep the terrible effects of sinusitis at bay, it will allow you to still have smell and taste and breathe properly,what other non steroid drug will do that for allergy victims ? Glad to see you included magnesium on that list. People should read the “Magnesium Miracle” by Dr. Carolyn Dean. Were only getting about 10% out of our foods as compared to 100 years ago thanks to the mega food industries!! l-arginine should be taken with l-citrulline. John is not only tall but also handsome. I traveled not only by plane but also by train. This seems a case of opposition, not additition.